The CF-graph provides a unique guide in the complexity of reality. The widening of thoughts displays the difference between visibility in a dualistic environment and in a tetradic territory. A dual frame of reference is used in the first case, reducing differences to oppositions. There are still differences in the second case, but the aim is now to search for similarities and resemblances. The active role of the observer in the communication process is acknowledged. It is necessary to widen the scope of the dualistic frame of mind if the quadralectic mood will be understood. The nature of duality prescribes a widening in the ‘visible area’, because there is no gradation in the invisible area. The dualistic frame of reference gets confused when a quadralectic mind talks of ‘invisible visibility’. A concordance of quadralectic and dialectic thinking is only possible in the Third Quadrant (of a quadralectic division), which is governed by a ‘visible visibility’. The Part, as a visible proof of division, is the vital link between the lower and higher stages of division thinking. 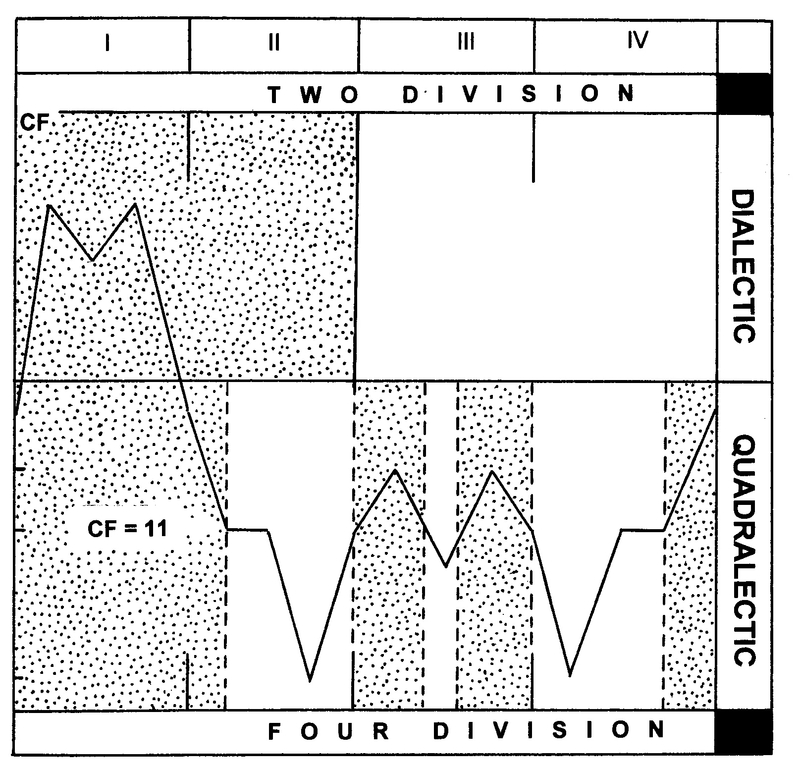 The highest understanding is found in the pinnacle of lower division imagination, the material, when the Third Quadrant opens with the CF-value of 11. The definition of visibility is part and parcel of the third step in the Second Quadrant (II, 3), i.e. even before the actual visibility of the Third Quadrant (III) has shown itself. The creation and notion of (visible) visibility is a monumental event and the crown on the inquiry into the nature of communication. The CF-graph, as the product of a conceptual exercise (of shifting four-divisions), holds the key to a genuine representation of the interchange between the communication partners. The rigid approach to visibility, in a dualistic environment, demands an exact figure (of the CF-value) in order to participate in the understanding of the CF-graph from its own (limited-oppositional) point of view. A subjective interpretation of the graph-as-a-whole is required in order to bridge the gap of comprehension. This necessity has led to the proposal to put the boundary of empirical visibility in a quadralectic communication cycle at the value of CF = 11. The arguments for this choice are, first and for of all, the noticeable beginning (and end) of the Third Quadrant with this particular CF-value. The Third Quadrant embodies the (visible) Part in the quadralectic view, although CF-values within the quadrant vary considerably. Two ‘highs’ (CF = 13) and one ‘low’ (CF = 10) are characteristic of the Third Quadrant. A quadralectic mind perceives this setting of subdivisions as a repetition of the major four-partition on a smaller scale. The dualistic mind only sees a part or not a part, without any intermediate stages. 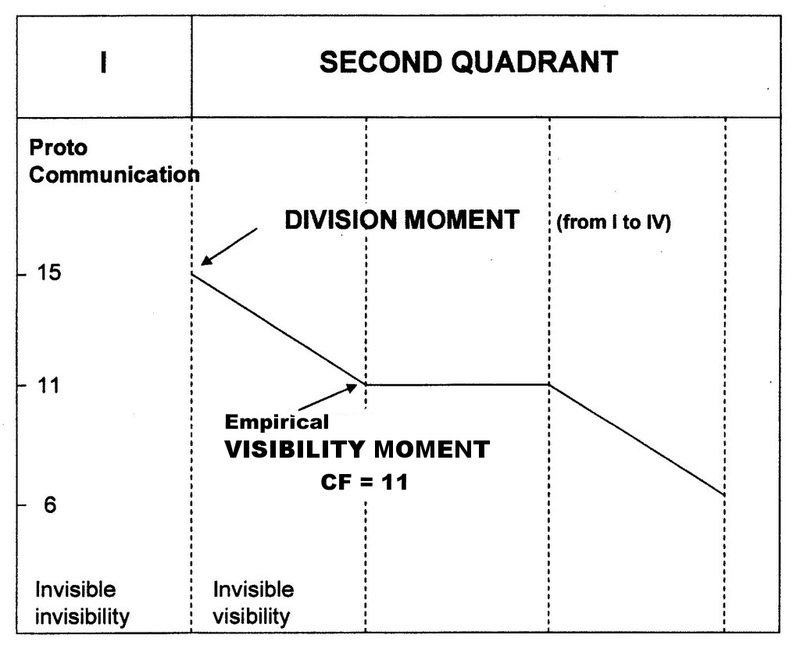 The second consideration to put the (visible) visibility boundary at CF = 11 is provided by the horizontal lines in the second part of the Second and the third part of the Fourth Quadrant. The CF-graph reached at those particular moments/places some sort of equilibrium at the value of CF = 11. They represent the only events on the CF-graph were a continuation of the communication is not associated with changes in intensio or remissio. This typical capacity provides a boundary in its own right. The start of the visible visibility (at the CF-value of 11) is visualized in fig. 48. Fig. 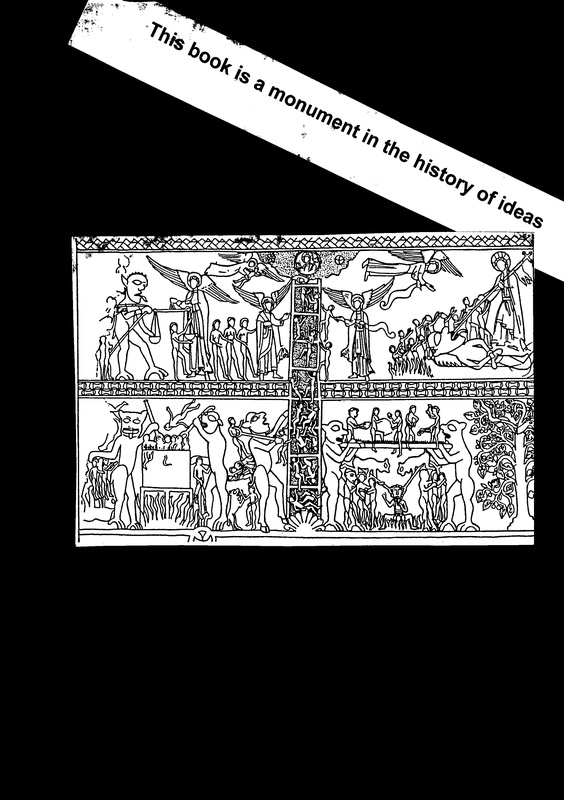 48 – The various important moments at the start of a quadralectic communication. The theoretical-empirical visibility on the CF-graph starts at the beginning of the second quarter of the Second Quadrant, where the CF-values reach the value 11 for the first time. This identification implies that every quadralectic communication, which makes itself known and has a certain extension, is preceded by an invisible period (of 5/16 V), called the proto-communication. The (subjective) choice of the CF-value 11 as the beginning of an empirical visibility makes this value of special importance within a quadralectic setting. The correct interpretation of this point – which is only possible in a tetradic environment – is exactly the moment where the two-fold and the four-fold, quadralectic interpretation diverges. The absolute way is keeping to the letter of the law (or definition). This means: under CF = 11 visible, over CF = 11 invisible. This con-ceptual position has to be placed in the third quarter of the Third Quadrant (III, 3). If we apply this strict rule to the Third Quadrant as a whole, it turns out that the visibility (of the Part) is not very prominent. In other words, the part does not have a good view of itself, in terms of its own definition. Most CF-values in the Third Quadrant are higher than the (arbitrary) ‘visibility-boundary’ CF = 11 and only the area around the CF-value of 10 qualifies for a ‘real’ visibility in an empirical sense. The greater visibility in terms of intensio are reached in the Second and Fourth Quadrant, when the CF-values reach their lowest points (CF = 6). Fig. 49 gives a comparison between the ‘absolute’ (CF<11) visibility in a dualistic and quadralectic environment. The multitude way is anticipating the dynamic visibility of the higher division thinking. The cognitive position dwells in the fourth quarter of the Third Quadrant (III, 4). Polarity, as an oppositional rigidity, is left behind and a quadralectic setting of the CF = 11 value can now be envisaged in a different way. A perceptive plurality with unlimited imaginative possibilities enters a communication at the very moment that polarity has lost its grip on the human mind. Opposition can be seen as a phase in a wider setting, rather than being characteristic for the communication-as-a-whole. The conscious use of four different types of visibility – in every stage of the communication – puts the empirical visibility in its proper place. It is just a static moment in time, with limited boundaries, in a sequence of other types of observances. The multitude way (of thinking) opens a gateway to the world of the Fourth Quadrant, with the (Smutsian) ‘whole’ as a new unit of measurement. A full (tetradic) communication includes the previous stages of division thinking. Fig. 49 – A graphic expression shows the comparison between the areas of empirical visibility in a dualistic and quadralectic environment. The CF-value 11 is used here in an ‘absolute’ sense to indicate the boundary of (visible) visibility. The upper box with the dualistic vision has the dividing line between the visible and invisible right in the middle of the total communication. The lower box shows four areas of invisibility (dark) and three of visibility (light), representing the quadralectic perception. 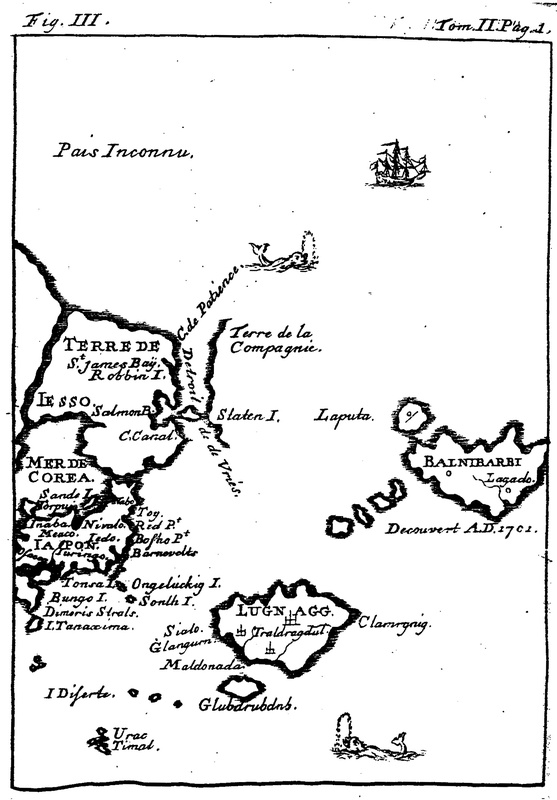 The definition of visibility in the form of a single CF-value is the ultimate crown on an intellectual voyage, which had no beginning and no end. Visible visibility (including our own presence in this world) is the result of a special interaction between communication partners, in which the choice of a (primary) division is of the utmost importance. The human being, as the Great Observer, stands in a universe of unimaginable dimensions and is only equipped with its own ability to order the observations in a comprehensive way. CF=11 looks like the Philosophers Stone in an alchemists’ dream. The last station in the Second Quadrant and the first in the Third Quadrant is an important boundary. The CF-value is, back again, at the visibility boundary CF = 11 and marks the end of a period of ‘insight’ (values below 11), without proper means to express it. It is, to a certain extend, the end of the ‘Age of Innocence’. The beginning of the Third Quadrant (III, 1) opens up a part of the communication cycle in which the physical-visible facts play a conscious and important role. The Third Quadrant, as a whole, is the realm of the material and the empirical. It is the home ground of facts and figures. It is therefore somewhat surprising, that the first movement between the communication partners in the Third Quadrant is one of remissio or separation, losing the actual physical visibility (with values higher than CF = 11). This state of affairs has a strong philosophical and psychological impact, because it means, that the very moment, we comprehend that our visibility is objectively true (because it is physically measurable), we lose contact with the material. An effort to see properly results in losing sight. 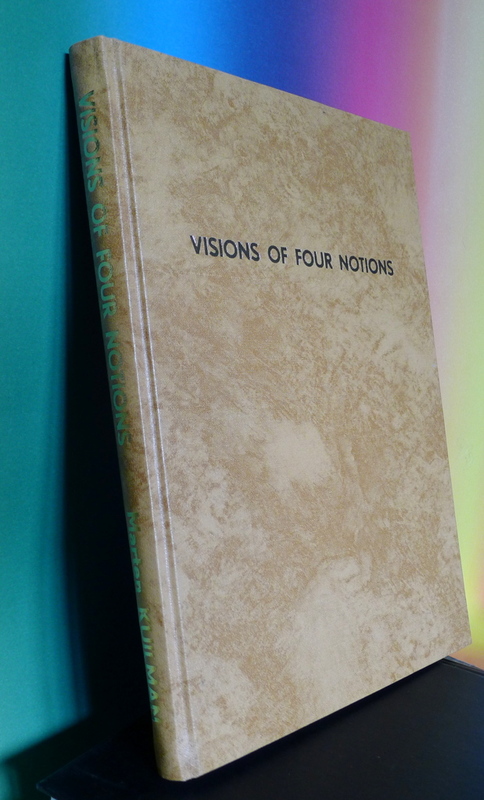 The process of abstract detachment of the material by way of a physical approach finds a climax in the First Visibility Crisis (FVC). This point lies at the end of the first quarter of the Third Quadrant (III,1). The CF-values reach a (relative) maximum of thirteen (13), which is the highest value of remissio within the (visible) visibility area X. The real understanding (in terms of an empirical truth) of the material presence is lacking, while the active contributors are aware of it. They experience the impossibility to reach further in the material reality. Or worse, are beaten back by it. Every push or deeper approach means a further moving away. A merciless duality rules the exchange of information. This inability to mark the ultimate boundaries in a dualistic environment often leads to an identity crisis. The First Visibility Crisis (FVC) is first and for all a mental affair, resulting from the limited view which had prevailed up to that moment. The crisis can be seen as a moment of gnostic awareness. Unfortunately, the conclusions do not always have a pleasant character. The innocence is lost, and a human being becomes aware of its shortcomings. Every choice – even the most basic one – leads in an oppositional environment invariably to a symbolic struggle between victory and defeat. And in the realm of the conscious visibility is much to lose. If it is not our personal integrity, then it is certainly the fulfillment of our ideals, which can get severely beaten in this phase of the communication. Disappointment is a genuine psychological setting at this point. Suddenly, the visible world is filled with obstacles, which are hard to overcome. Trees do not grow into heaven. Reality can be hard and failure is just around the corner. The feeling of happiness, which can be expressed, according to the American psychologist and philosopher William James (1842 – 1910), as a fraction of accomplishments and expectations, can become unstable (JAMES, 1890/1981). Either the achievements or the expectations reach short of their goal and feelings of unhappiness are able to develop. The balance can be restored by a move towards greater visibility (or lower CF-values). The psychological crisis, due to a lost equilibrium between the visible and invisible visibility, is counteracted by a return to the situation as at the beginning of the Third Quadrant (CF =11). The middle of the visible visibility area X is called the Pivotal Point. The CF-value is 10 and therefore within the range of visible visibility. In fact, it is part of only a short stretch in the Third Quadrant, in which the CF-values fall within the visible visibility range. It is here, around the Pivotal Point (PP), that the two- and four-division are able to interact to its full capacity. The middle of the visibility area provides a rare moment in which the position of a dualist comes close to that of a quadralist, because both find themselves in similar situations. The world of polarity is both felt and understood here by the two- and the fourfold thinker. The former might not grasp the full viewpoint of the latter, because of the lack of conceptual space, but at least an understanding in the hic et nunc is possible. The pivotal point (PP) is often seen, by all parties, as a halfway point, conveniently situated between the beginning and the end. The moment of reflection on duality can lead to such fashionable notions as a ‘midlife crisis’ and/or a ‘point of no return’. The psychology, which finds its moments of glory in the description of basic instincts, shows a great deal of interest in the area around the pivotal point. It is here that imperceptible observations of the mind can reach a degree of respectability and even apply for a scientific status. The Second Visibility Crisis (SVC) is a repeat of the First Visibility Crisis (FVC), but in a more ‘material’ setting. The CF-values reach, for the second time, a relative peak with a CF-value of 13 at the end of the third part of the Third Quadrant (III, 3). This means, that a complete empirical visibility cannot be achieved, but this short-coming is less felt at this stage. Instead, it is disguised behind a rampant materialism and the enjoyment of a vibrant Golden Age. Trees seem to grow into heaven and it ‘never was so good’. However, with the material concern comes the impossibility to control the full scale of its presence. The more physical (or monetary) wealth one gathers, being it either as a state, institution or person, the more likely is the chance that others try to share in its use. Some do it peacefully, as hangers-on, but more often the greed (or need of survival) is less hindered by scruples. Wars, uprisings, struggles, quarrels and disputes are characteristic of the Second Visibility Crisis. The contrast between a good time on one side and crisis on another is the stuff of which history is made. Often, it is not even the hardship, which causes to remember, but the notion that nothing good will ever hold. That life is just a moment in time.